Multi-Functional: The 300 Series LAN Stations/Workbenches are commonly used as technology benches, video editing station, command consoles, security monitoring stations, and much more. Various Sizes Available: We know areas, such as shipping stations, home offices, and technology centers, vary in size and need. That's why we offer the 300 series in four sizes (24"/48"/72"/96") so you can choose the LAN station suitable for you. 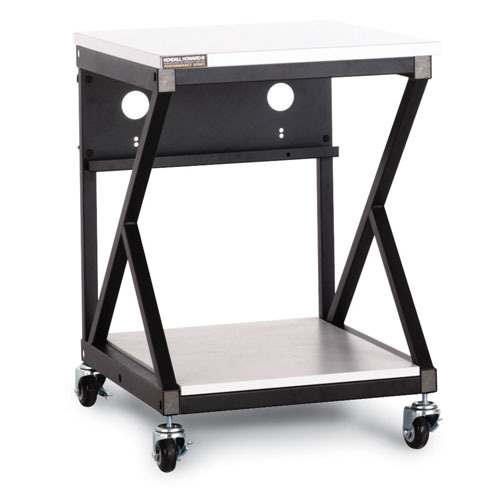 Optional Accessories: Available accessories include Accessory Bars, LCD Monitor Mounts, Keyboard Trays, Casters, and much more. The preset mounting holes under the work surface allow for one accessory every 24". Accessories that mount above the work surface easily attach to the accessory bar. The work surface height is fixed at 30". 28" deep lower shelf made up of two 14" deep modular shelves. Please note that the photo above includes the optional caster kit (5200-3-001-00).